1/2 Wednesday, 81/63, sunny, S5-10 - The last two nights in my dreams, I’ve been confused about where I am - I think we’re underway and yet we’re either anchored or at dock. In my sleep, I ask Dobbs questions about our surroundings and he patiently answers them, though sometimes he forgets to mention that we’re stopped. Then I’m hard on him about leaving the helm unattended (remember, I’m asleep) and he realizes I’m unconscious. We’ll be spending the month of January in Titusville, at the municipal marina. Looking at it from a purely budgetary perspective, we’re operating on $19/day. If we continue traveling south, any days that we can’t sail cost about $10 each in diesel. Any single night that we stop at a marina costs roughly $62. In order to limit free or inexpensive land access to live-aboard permanently moored boaters, many marinas no longer offer dinghy dockage or charge $15-$20 for the privilege. Public land access is limited to parks near bridges and boat ramps. Anchorages near these landings are often clogged with bum boats, meaning for us a long row in from the outer edge of the field. Groceries cost about $75/week; higher if we’re in a tourist town like St. Augustine, lower if we’re in a working-class town like Titusville. Two days of motoring and a marina stop use more than 4 days’ worth of savings, leaving $51 for groceries that week, provided we don’t motor the other 5 days or stop at another marina. You see the challenge. If we stay in an area for a month, we enjoy the much lower monthly dockage rate (in the case of Titusville it’s $358.80). We opted to skip paying for 30A at the monthly rate of $51 and see how we do with just our solar panel and motoring out to sail regularly. If need be, we can pay the daily rate of $5 and plug in to charge for a day (or switch to the monthly plan). For the 31 days of January, our budget is $589. Less dockage, we have $230.20 to work with, or $7.42/day (or $52/week), about the same as the traveling scenario except that we have more control over spending and the potential to earn money offering our rigging services. We chose Titusville for a number of reasons: It’s just below the “cold” line - daytime temperatures are 75-85F and evenings are 50-65F; the water temperature is 75-degrees; the Indian River is wide and deep enough to offer nice sailing for 60 miles south of here, with two fine anchorages along the way; the municipal marina is about the lowest cost dockage anywhere on the ICW and is small and low-key while still offering all the services we need; and the town is walkable - grocery, post office, tennis courts, parks, swimming beach, and an attractive, striving downtown, all within walking distance. We enjoyed leftovers of heuvos rancheros for breakfast and the simplicity of walking down the dock to take Murphy to shore. 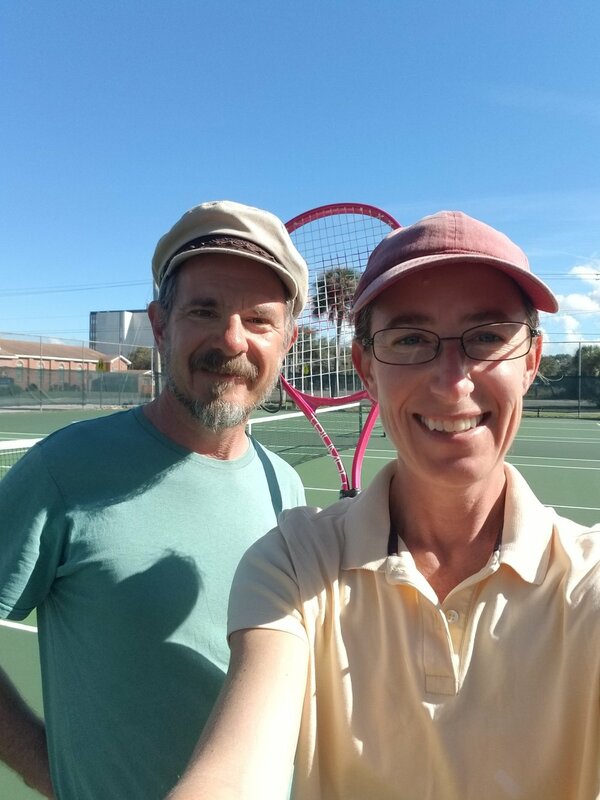 Mid-morning, we walked to the Campbell Community Park and played tennis - the longest and best set we’ve played in months. Dobbs won 7-5 - I was exhausted! This was the “before” photo - after would have shown us “dewy” from a serious workout. We walked home to Grace for lunch and a little siesta. Then I walked back out to the Sav-A-Lot for groceries and Dobbs took care of some domestic duties on the boat (fill water, change litter box, set salt shaker in sun to dry out). I love being able to walk to the grocery store, and while the Sav-A-Lot doesn’t offer organic options, I appreciate how small and simple it is. I also like that the purchases go back into the cart for the buyer to bag in her own bags or boxes afterward - the store doesn’t supply bags. 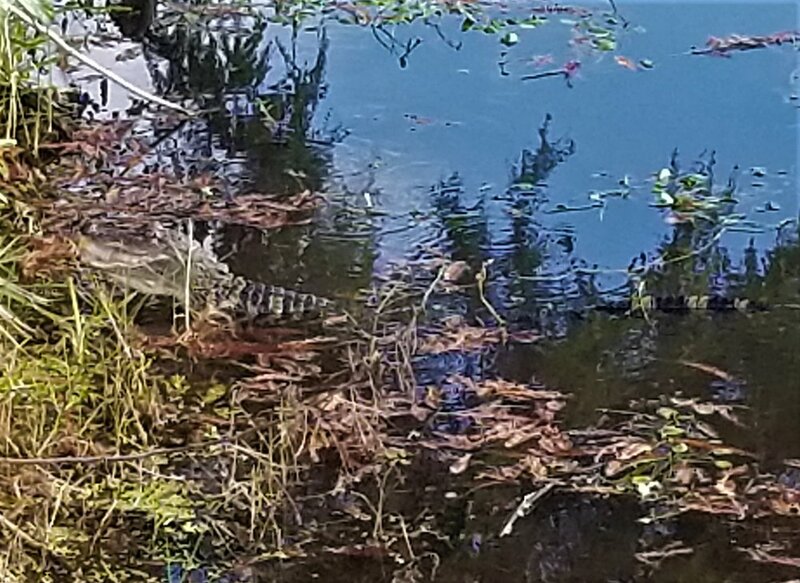 This fellow was hanging out at the park pond, snacking down what appeared to be a baby turtle. I returned home around 4pm and did a little writing after stowing the groceries. Then we sat in the cockpit for a while, saying “hello” to passers-by. Later, I heated up leftover split pea soup and made grilled cheese for dinner.